Posted on Saturday, July 26th, 2014 at 6:30 pm. 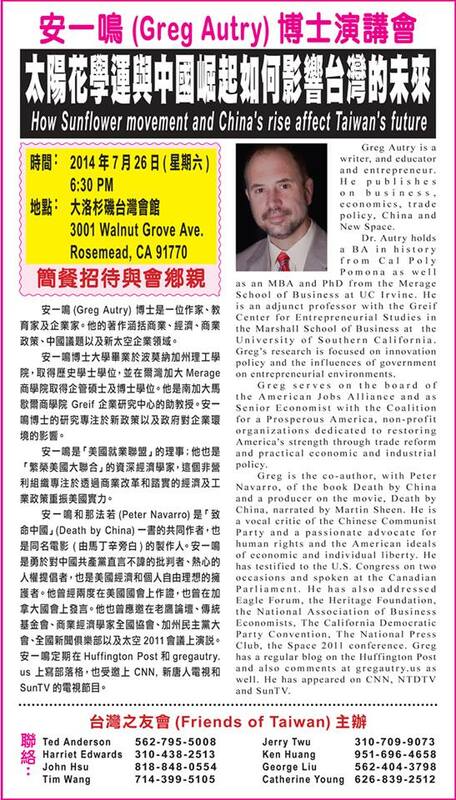 Come out on Saturday and listen to Greg Autry talk about how the Sunflower Movement and China’s rise affects Taiwan’s future! Greg Autry is a writer, and educator and entrepreneur. He publishes on business economics, trade policy, China and New Space. Dr. Autry holds a BA in history from Cal Poly Pomona as well as an MBA and PhD from the Merage School of Business at UC Irvine. He is an adjunct professor with the Greif Center for Entrepreneurial Studies in the Marshall School of Business at the University of Southern California. Greg’s research is focused on innovation policy and the influences of government on entrepreneurial environments. Greg is the co-author, with Peter Navarro, of the book Death by China and a producer on the movie, Death by China, narrated by Martin Sheen. He is a vocal critic of the Chinese Communist Party and a passionate advocate for human rights and the American ideals of economic and individual liberty. He has testified to the U.S. Congress on two occasions and spoke at the Canadian Parliament. He has also addressed Eagle Forum, the Heritage Foundation, the National Association of Business Economists, The California Democratic Party Convention, The National Press Club, the Space 2011 conference, Greg has a regular blog on the Huffington Post and also comments at gregautry.us as well. He has appeared on CNN, NTDTV, and SunTV.